When it comes to books for young adults, it seems the only types out there involve some sort of love story between a human and a supernatural creature or a terrifying future that involves the end of the world and trying to survive it. While these have captured the attention of many young minds and continue to entertain in both the written word and the box office, are the messages within these stories ones preteens and teenagers should be reading? Why not give these young minds something fun rather than morbid to read? 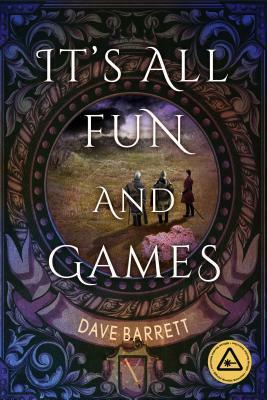 Inkshares author Dave Barrett has done just that by writing his debut novel about an activity not many people think about, but one that can be incredibly fun: live action role playing. Allison is in for more than she ever believed to be possible when her best friend, TJ, talks her into joining his LARP group for a weekend of epic fun. While she claims live-action roleplaying is a geeky pastime, she becomes intrigued when she learns that she must be the healer for her team as they defeat monsters and travel to find a mysterious treasure. Shortly after they begin their quest, the teenagers discover the fantasy world, the mythical creatures, and the powers they imagined themselves to have are all actually real. What they believed to be the ride of their lives turns into the fight of their lives as the small band of friends must aid each other to stay alive and discover a way to make it back to the real world… if there is a way back. One of the winners of The Nerdist Collection Contest in 2015, It’s All Fun and Games is a breath of fresh air for the young adult genre. It proves to be a fun story with a good message for preteens as well as young adults, especially in today’s world. With popular culture expanding each year, there are more and more preteens and teenagers who claim themselves to be “nerds.” Barrett has created a story to tell these “nerds” that they are not weird for loving what they love, that they should do whatever it is that makes them happy, and to ignore the ones who make fun of them for what they enjoy doing. A much better message to convey than “I’ll find my true love as the world is coming to an end” or “I’m an awkward teenager who can only find love if I’m with a werewolf/ vampire/ zombie/ fill in the blank”. Barrett has brought to life a fantasy world of his own design in both a fictional and realistic sort of way. The story begins in reality where the characters are going to live action role play (LARP) for a weekend. For those who are familiar, but unsure of the rules or for those who have no idea what LARPing is, Barrett does an excellent job of giving a brief, but detailed description of what it is and what the players do. Then the characters gradually traverse into the fantasy world where they discover that it actually isn’t all fun and games when one’s life is on the line. This new fantasy world is introduced very briefly to the readers and not much is revealed as of yet. It is a bit of a letdown because readers want to know and learn what all this new world contains. A few small towns and a handful of fantasy creatures are introduced, but not much else. The readers know as much about the world as the characters do, so perhaps Barrett wishes to have the readers gradually learn what lies ahead in this strange new land along with the characters. The characters in It’s All Fun and Games are well-written for its audience. Readers will follow six main teenagers who are all part of one team: Allison – non-nerdy girl/ healer; TJ – Allison’s best friend/ wizard; Simon – football player/ fantasy creature; Chuck – teammate/ thief; Jimmy – teammate/ berserker; Stuart – known as Stu/ archer. These teenagers are very relatable in their actions and thoughts and Barrett accomplished a feat not normally found in young adult novels: none of the characters are stereotypical teenagers. They are just normal kids trying to have fun… then trying to survive. What is interesting is that when they do arrive in the fantasy world, no character is safe… not even the main protagonists. Perhaps the only strange thing with the characters was that they seemed a bit too accepting of all that was happening. Strange fantasy creatures become real and they have to literally fight to survive and they just seem to be okay with it. It doesn’t seem like the way someone would react if it really did happen in today’s world, but Barrett does put in a brief tidbit to help explain this aspect of the story. All in all, It’s All Fun and Games is an enjoyable introduction to a new type of young adult series. No doomsday events, no romances with creatures hundreds of years old, just fantasy fun and games. It has an excellent message for younger minds to love what they love. It introduces an activity not normally thought of when someone asks, “What do you want to do this weekend?” It interweaves reality with fantasy, for what fan of fantasy has not wished for a fantastical world they loved to be real? Readers will most likely wish for more of the story and for more of Barrett’s fantasy world and, hopefully, there will be more in future books, including the sequel More Fun and Games being written now. Until the sequel’s release, readers will attentively anticipate what lies in store for the characters and where the story is going next.